About 2 weeks ago I went into Cool Cottons while Marie was there, searching for background fabric for the blocks I got last fall in the Nubees block swap through Flickr. I was trying to set these blocks, primarily in blue, aqua, yellow and grey, bordered by a blue and grey Aneela Hoey coordinate from her Sherbet Pips line. After auditioning several possibilities, we landed on one of the Alexander Henry Heath bolts. And it is PERFECT! Now it's just a matter of figuring out how best to quilt this puppy, and actually getting it done! One more quilt top on the pile of unquilteds. 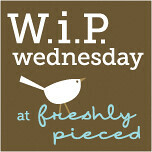 As a periodic blog reader I undoubtedly came across all of the WIP Wednesday posts (hosted by Lee at Freshly Pieced) during 2011. As a novice blog writer, I wasn't ready to take on such a commitment. It's a new year, right? Is anyone else feeling the magic of January 2012? So, I know I missed the first installment, but I figure better late than never, yes? So, here's MY first contribution to the list-making, track-keeping, over-sharing of WAY TOO MANY things on my plate! I'll begin with the UFOs. One of my goals this year is to address several (if not all) of the projects that were begun in years past, then shelved indefinitely, primarily because they were either from classes I took but didn't follow through on, or simply because the gift-making and etsy-friendly projects took precedent. My Summertime Stars quilt using Amy Butler's "Love" – discussed in detail in this post from yesterday. Half of my blocks for my second version of the Warm-Cool Quilt Along, hosted by Jeni at In Color Order. Must finish piecing (and then quilting and binding) the November quilt for the Bliss Circle of do.Good Stitches. A set of placemats cut out and awaiting stitching/quilting. Started quilting the I-Spy quilt top I finished last week. Still have a fair bit to go, though! Hopefully by next week it will be among the "Completed" list! I've been adding to my received blocks from September's Nubees block swap on Flickr. I now have as many as I want, with the sashing fabric around each one. I think I might need to audition another background possibility, but if I DO end up going with this Michael Miller fabric, I'll still need to get a bit more. Another quilt top that's been hanging out on a shelf for quite a while, which I finished quilting this past week, and am just in the process of binding. So, what is everyone else working on?? Now go get inspiration, as I did, from all of the other creative folks linking in at Freshly Pieced!! Lately I have been so concentrated on trying to bust out these smaller items that it has actually been ages since I have completed a quilt. When I moved into the studio space, it gave me an opportunity to reorganize, and pull focus to some of my UFOs, including finished quilt tops that have been hanging around for years waiting to be quilted. Some of them are so simple, and ones that I hope to be able to show at craft fairs, or at least to be samples of patterns/formulas that I work with. Yesterday I basted my first quilt in many months. I'll be posting more as it develops. Happy Saturday!